So often in life, there are no easy answers to problems we face. The only way to solve them is to gather as much information as possible and let everyone contribute to the conversation. That’s why we have a special category reserved to provide a forum for opinions and discussion about various subjects. When we keep an open mind and welcome the ideas and experiences of others, we sometimes learn something that may change our point of view. Everyone is encouraged to participate. You may change someone’s mind today! Uber and Lyft have become an exceedingly popular alternative to public buses and taxi cabs. Both of these companies are most notably known for allowing riders to choose their ride preferences and certain customizations. What about options for those who require wheelchair accommodations? Let’s take a look at the 5 most frequently asked questions when it comes to Uber and Lyft’s services to those who need wheelchair accessible vehicles. What is a WAV (Wheelchair Accessible Vehicle)? A wheelchair accessible vehicle, known more commonly as a WAV, is a vehicle which has been modified to easily accommodate a wheelchair. Typically, the interior is adapted in order for a wheelchair to fit as well as either a wheelchair ramp or a power lift for convenient access. Does Uber or Lyft Have Wheelchair Accessible Vans? Uber offers UberWAV which connects riders to drivers with vehicles which can accommodate wheelchairs. UberWAV drivers have completed a special training course in order to help you or a loved one safely enter and exit the vehicle. It is important to note that in areas where WAV services are not available, Uber will send alternatives directly to your phone. Lyft offers Access Mode, which puts riders in need of a WAV in touch with drivers who have a WAV. As with Uber, in areas where this service is not available, alternative transportation methods will be sent to you. How to Request an Uber or Lyft WAV? Requesting a WAV with both Uber and Lyft is quite simple. For Uber, you will simply use UberWAV to schedule an on-demand ride that meets your needs, schedule, and location. When utilizing Lyft, users will need to enable Access Mode, by tapping ‘settings’ on the app and making sure the ‘wheelchair access’ toggle switch is green. Next, you will type in your destination and access wheelchair mode to find your perfect ride. Does Uber or Lyft Offer Any Discounts? From time to time Uber offers promotional discounts for both first-time passengers and loyal customers. The type of discount and expiration dates are constantly being updated, so be sure to search for any eligible promotions before you pay full price. Percentage discounts – Receive a certain percentage off of your ride. Fixed discounts – Remove a certain amount from the total cost of your ride. Flat rate – This means a set fare for rides that would typically cost up to a certain amount. Lyft credit is a system in which Lyft users earn credit each time they take a ride. These credits can then be applied to a qualifying ride. How Do I Identify an Uber or Lyft Driver? Both Uber and Lyft take safety very seriously and have measures in place to ensure you are able to confidently identify your Uber or Lyft driver. Once you have been assigned a driver by Uber, you will be sent information about the make and model of the vehicle, name of the driver and a photograph of both the driver and the vehicle. Upon arrival of your Uber ride, verify the information and pictures match the approaching vehicle. Lyft offers similar safety measures by also sending passengers detailed information and photographs of both the driver and the vehicle. Passengers can verify the vehicle that pulls up matches the information received. For both Uber and Lyft, thorough background checks are conducted before they are allowed to become drivers for either company. When it comes to transportation. It’s all about convenience. 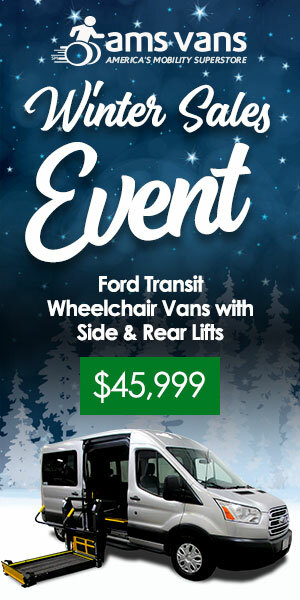 Wheelchair accessible vehicles are specially designed to allow for comfortable and convenient travel. With the WAV services of Uber and Lyft, transportation is easier now than ever. AMS Vans understands the needs of those who require wheelchair accessible accommodations and have over 20 years of experience in the industry. Contact us today to learn more about our services! Up until the present day, the typical design of the wheelchair models used by persons with disabilities has generally followed a somewhat dedicated commitment to function over form. From the introduction of the first lightweight, steel, folding, portable wheelchair in 1933 — a model known as the ‘X-brace’ — advances in the design and technology of newer machines have come periodically. Factors in the advancement of wheelchair models — including propulsion method, control mechanism, and technology — are generally influenced by purpose and price. Newer wheelchair model categories include manual self-propelled, single-arm drive, reclining, standing, sports, and all-terrain designs that serve to enhance mobility freedom for their users.